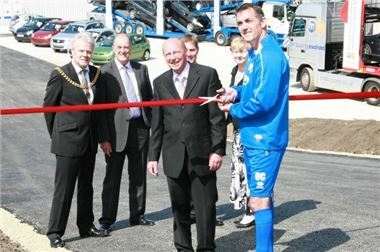 pre-season preparations to cut the ribbon at the site on Rosegrove Lane in Burnley. improved site now has the capacity to display over 750 cars at any one time. deliveries. Over 30 people alone are employed in this part of Motorpoint. investment on our part and it's great to finally see it come to fruition." roughly one every 25 minutes). currently listed at number 83 in the Sunday Times Top Track 250.